Since the introduction of the Treasure of Thundera in “ThunderCubs Part I”, a good chunk of subsequent ThunderCats episodes explored the individual artifacts of the treasure. 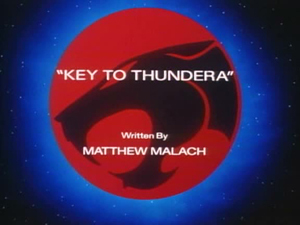 In this episode, writer Matthew Malach analyses the discovery and purpose of the Key of Thundera. In Cats’ Lair, Lion-O and Snarf are desperately trying to decode the Book of Omens but only succeed in straining their eyes as they stare at the baffling runic symbols printed on the pages of the book. Snarf suggests using the Eye of Thundera as a magnifying glass to read the book but as soon as Lion-O does so, the Sword of Omens starts to interact with the Book of Omens via intense energy and casts Lion-O into the book. In the control room, Panthro, who is on New Thundera with Tygra salvaging for more pieces from the Treasure of Thundera, is communicating with Cheetara through the room’s telescreen. Just as he shows Cheetara his latest find, a key with the ThunderCats symbol on it, Snarf barges into the room, babbling for help. 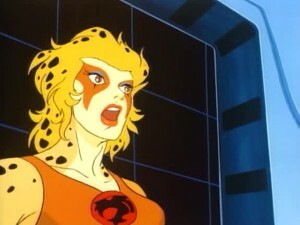 Cheetara follows the terrified nursemaid back to the conference chamber where, as he is showing Cheetara what happened to Lion-O, Snarf imitates Lion-O’s actions and gets sucked into the tome as well. 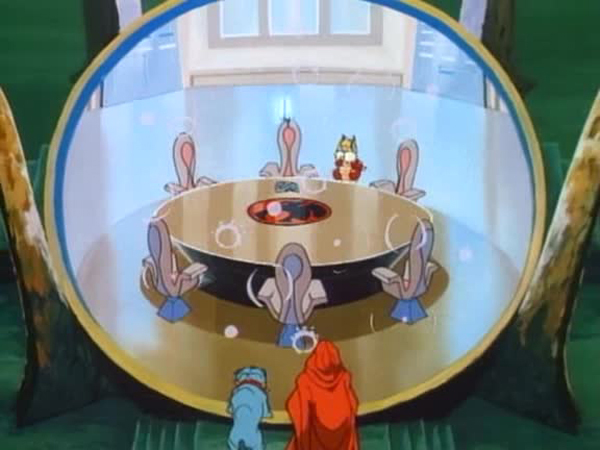 Meanwhile back in his pyramid, Mumm-Ra is monitoring all the events unfolding inside the ThunderCats’ fortress with great delight. “What better way for him to catch up on his reading?”, the ecstatic mummy asks rhetorically upon seeing Lion-O’s predicament. Not wanting to pass up a golden opportunity, Mumm-Ra materializes inside Cats’ Lair, hoping to grab the Book of Omens and destroy it. 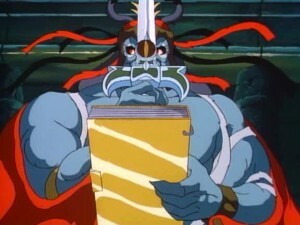 Cheetara however isn’t going to let Mumm-Ra get his bandaged hands on the book without a fight. The swift she-cat battles Mumm-Ra bravely, even employing a new “tornado technique” where she spins rapidly, sucking the Book of Omens and the Sword of Omens towards her. 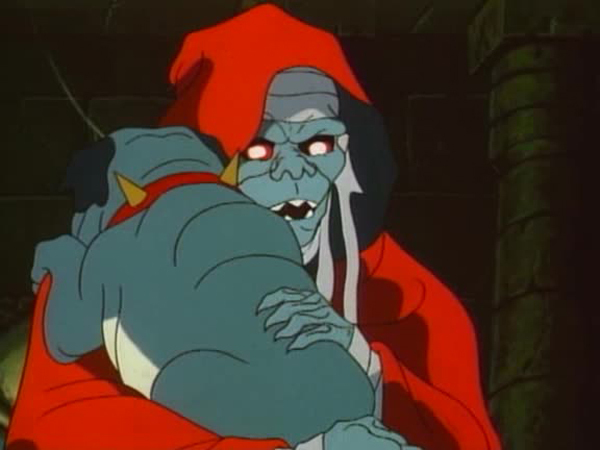 Unfortunately Mumm-Ra’s powerful energy blast knocks the wind out of Cheetara and he snatches the book and the sword and disappears back to his abominable abode. As Lion-O and Snarf are exploring their biblio-prison, they encounter a giant sentient statuette resembling the Eye of Thundera. 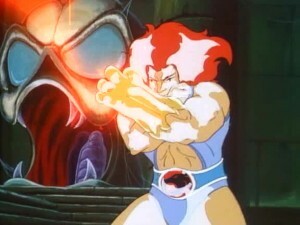 The being asks Lion-O for the Key of Thundera and when the young lord fails to present it, a number of pillars with dragon heads materialize and spew a shower of flames on the two hapless ThunderCats. Out of desperation, Lion-O calls the Sword of Omens and the mighty blade pulls him and Snarf out of the Book just as Mumm-Ra was about to boil it in his bubbling cauldron. Not giving Lion-O even a moment to compose himself, Mumm-Ra blasts him with bolts of energy. Lion-O avoids the onslaught just enough to summon his friends but eventually he and Snarf get wrapped in bandages by Mumm-Ra. 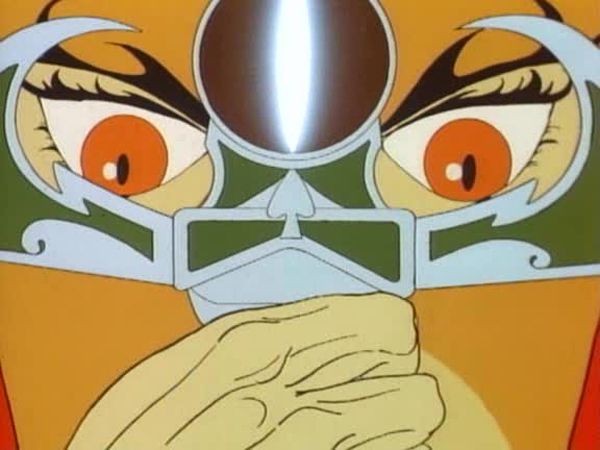 Just as curious as his cat-like nemeses, Mumm-Ra gets hauled into the Book of Omens when he uses the Sword of Omens to read it shortly before Cheetara and Wilykit reach the scene. 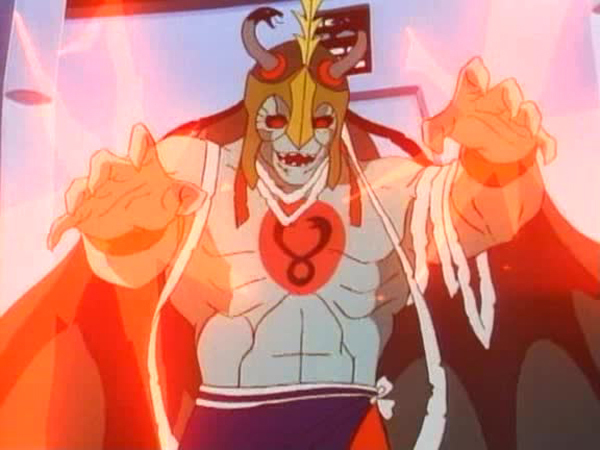 To everyone’s amazement, Lion-O, in a most selfless act of heroism, plunges into the Book of Omens and rescues Mumm-Ra from a fate of eternal roasting. 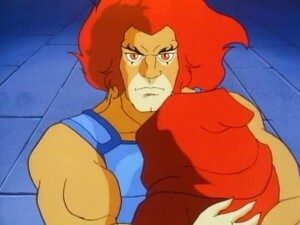 Before leaving the book, Lion-O promises the giant statuette in a Schwarzenegger style, “I’ll be back!”. Perhaps the most peculiar thing about “Key to Thundera” is how small a part the eponymous relic plays in the story. 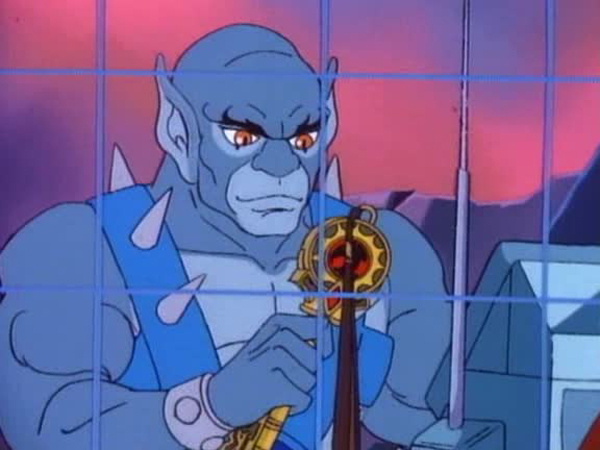 Even Panthro’s claim – “Finally found one thing this blasted key is good for!” – as he uses the key as a lever to fix the Feliner’s stuck throttle, alludes to the key’s futility in the main plot. Nevertheless, Malach maintains a good pace in his storytelling and the use of a limited cast eliminates unnecessary distractions. 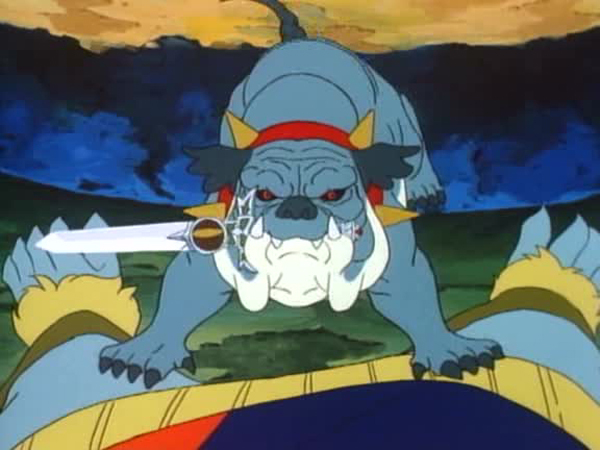 The episode is sprinkled with humor courtesy of the unlikely comedians Mumm-Ra and Ma-Mutt. 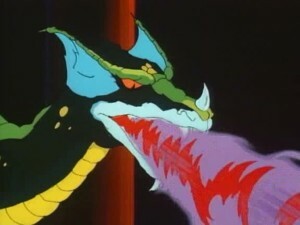 Mumm-Ra’s complaint about Ma-Mutt’s halitosis is rather amusing seeing as it is highly unlikely that the thousand year old rotting mummy’s breath would be minty fresh! Also the normally super-intelligent Ma-Mutt is depicted as a rather dumb dog in this episode. The way he constantly keeps on fetching the Sword of Omens when his master commands him to bury it will surely remind Garfield fans of the mindless mutt Odie. In summation, “Key to Thundera” is a quaint little episode with some appealing moments and good animation. Neither outstandingly good nor horrendously bad, the episode falls between these extremes and continues advancing the ThunderCats’ adventures in the second season of the show. 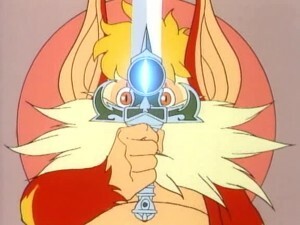 In the beginning of the episode, Snarf suggests that Lion-O use the Sword of Omens as a magnifying glass. During the early developmental stages of the ThunderCats, head writer Leonard Starr had designed the Sword of Omens as having two magnifying lenses between the crossbars. Mumm-Ra continues his habit of calling Ma-Mutt by alliterative nicknames such as putrid poodle and pusillanimous pooch. This episode does not feature any of the New ThunderCats and surprisingly, Wilykat is absent as well even though his twin sister is present. Mumm-Ra threatens to send Ma-Mutt to obedience school even though no such school has been shown to exist on Third Earth!